These high quality, long-lasting stamps never require replacement pads, eliminating wasteful plastic, foam and ink. You can re-ink indefinitely for thousands of clean impressions. Better than recycling, the PSI allows you to customize your stamp by ordering just the die. By keeping the original stamp mount you eliminate the need to buy a new stamp. More cost-effective for you and less contribution to landfill. 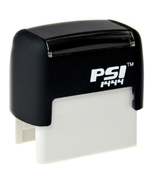 PSI Stamps are made from 50% post consumer recycled plastic. PREMIUM Self-Inker (PSI) 1919. Up to 4 lines of text. Impression area 3/4" x 3/4"
PREMIUM Self-Inker (PSI) 1444. Up to 3 lines of text. Impression area 1/2" x 3/4"
PREMIUM Self-Inker (PSI) 4141. Up to 5 lines of text. Impression area 1-5/8" x 1-5/8"
PREMIUM Self-Inker (PSI) 1854. Up to 4 lines of text. Impression area 11/16" x 2-1/8"
PREMIUM Self-Inker (PSI) 2264. Up to 5 lines of text. Impression area 13/16" x 2-1/2"
This slim design fits easily into your pocket. Custom self-inking stamp, up to 4 lines of text. Impression area: 11/16" x 2-1/8"
PREMIUM Self-Inker (PSI) 3255. Up to 6 lines of text. Impression area 1-1/4" x 2-1/4"
PREMIUM Self-Inker (PSI) 1479. Up to 3 lines of text. Impression area 9/16" x 3-1/8"
PREMIUM Self-Inker (PSI) 2773. Up to 6 lines of text. Impression area 1-1/16" x 2-7/8"
PREMIUM Self-Inker (PSI) 3679. Up to 8 lines of text. Impression area 1-7/16" x 3-1/8"